The Public Diplomacy Council hosts a brown bag lunch series. This ‘Lunch and Learn’ forum features speakers and public diplomacy experts discussing topics most relevant to the interests of mid-level Public Diplomacy Officers. 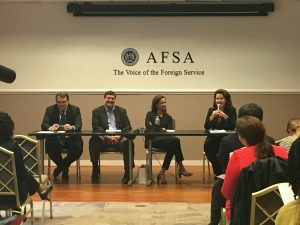 The forum is held at the American Foreign Service Association (AFSA), 2101 E Street NW in Washington DC (Foggy Bottom Metro), starting at noon. Sandwiches and refreshments are served. The Lunch and Learn sessions are announced in a weekly update emailed to Council members. You can review summaries from previous Lunch and Learn forums at our Meeting Notes page.